"Working at Play and Playing at Work" was the title of my presentation last week at Fort Bragg and Mendocino High Schools' career day. The lines of work are often blurred in the kayaking business. Our friend Paul Kuthe describes it well in his blog post "Strictly Business." 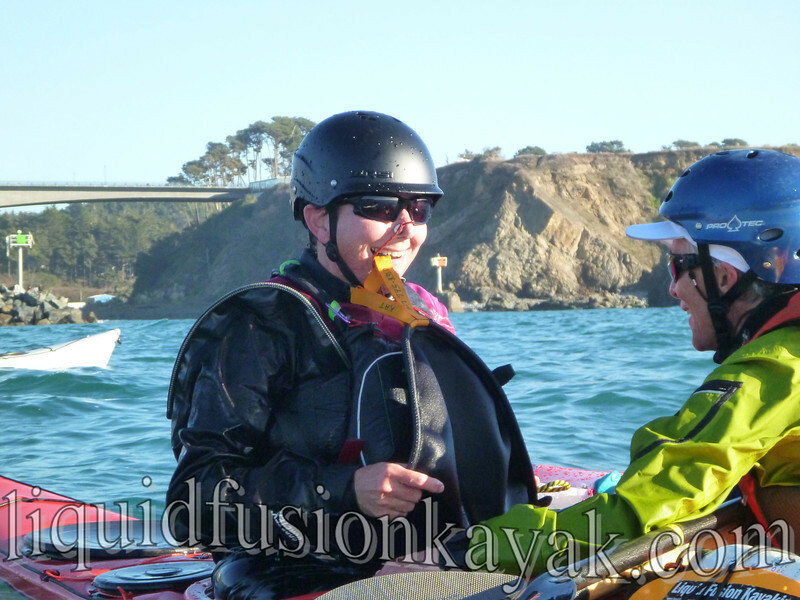 I highly encourage you to read Paul's post - it tells the tale of our adventures after the Golden Gate Sea Kayak Symposium. I have to admit though that this week the kayaking business feels like work as I get all of our accounting together for taxes and work on catching up on office work from when I was out "Playing at Work." I definitely need to schedule some time to PLAY! The quiver is ready to PLAY!!! The past 2 weeks have been a whirlwind of teaching and paddling and all of the energy and logistics that go into teaching and paddling. I have to admit that my mind and body are a bit tired but my spirit is soaring. Cate Hawthorne diagrams the surf zone. My 2 week whirlwind began with hosting Ocean Camp Northern California. 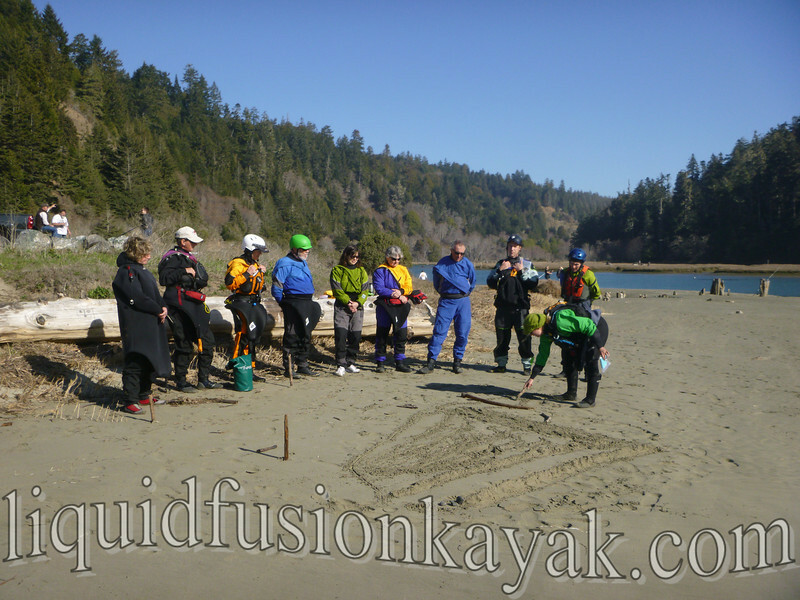 This was a 6 day sea kayak training camp taught by the team of Ryan Rushton of Geneva Kayak Center and Jeff Laxier and I of Liquid Fusion Kayaking. We rented a vacation home in Fort Bragg, planned meals and instruction, and rallied 8 students to come improve their sea kayaking skills on the Mendocino Coast. Peter and MaryAnn applying their strokes in rough conditions. It was an AWESOME week!!! We had sunshine, whales, surf zones, dynamic ocean conditions, and 8 eager students. Many skills were developed, limits were pushed, FUN was had, and lifelong friendships made. The primary physical complaint of the week was abdominal muscles being sore. It is debatable whether this was from paddling or laughing. Kat and Keri (aka Sunshine and Zippy) working together as a team. 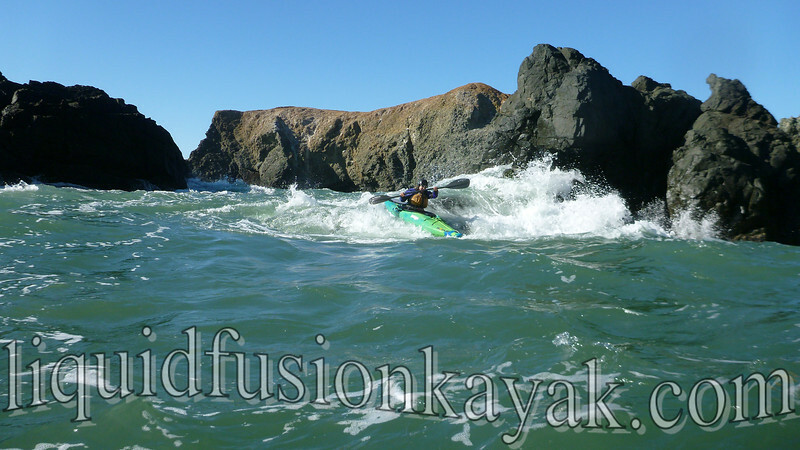 Following Ocean Camp, we journeyed to San Francisco for the Golden Gate Sea Kayak Symposium (GGSKS). I have to admit that traveling to a symposium is a bit of a stretch for me. Teaching in unfamiliar venues with different instructors and being surrounded by lots of people challenges my quiet nature. However, this year I was excited for the symposium. I felt honored to be selected as a lead coach and excited be reunited with paddling friends and colleagues. 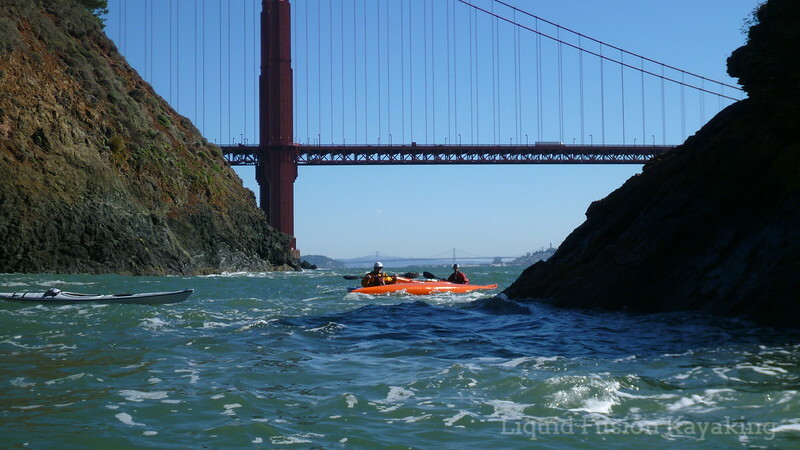 Practicing sea kayak rescue skills outside the Golden Gate Bridge. This year's GGSKS was exciting as there were many new faces in the crowd and some new courses. I was super stoked to be teaching Whitewater of the Sea (rock gardening in whitewater kayaks) with Jeff Laxier and Surf Kayaking (in short boats) with Kate Hives of The Hurricane Riders. The rock garden class went well. 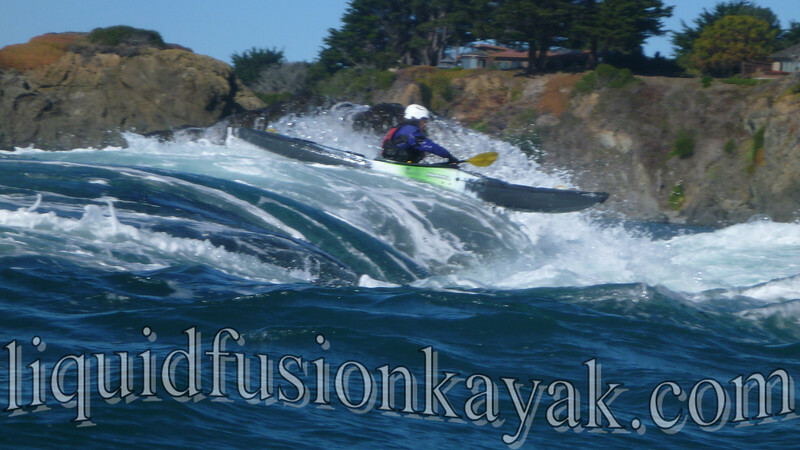 We had a group of skilled whitewater boaters who were keen to learn the nuances of whitewater paddling in the ocean. They were quick learners and we had a fantastic day of exploration and play - complete with a close encounter with a gray whale (sorry no photos of the whale). Leah with great timing in the GGSKS whitewater kayak rock gardening class. 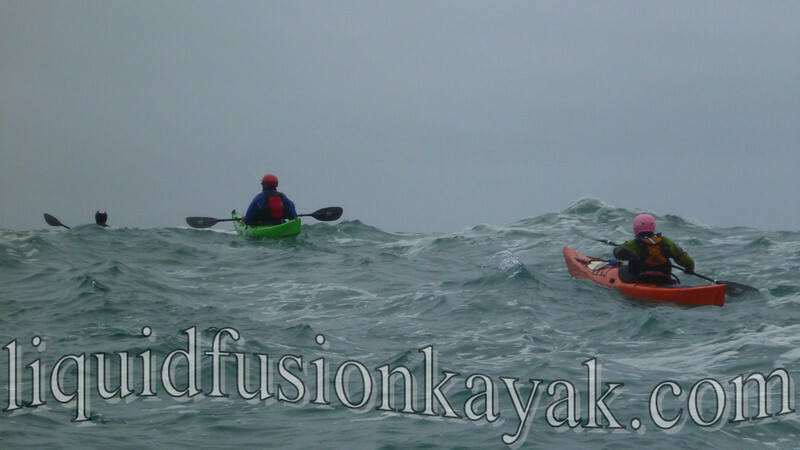 A storm came through on Sunday making surf conditions poor so the decision was made to cancel the surf kayak class. Coaches Kate Hives, Mathew Hoff, and myself put our heads together and offered the students the option of switching to another class or doing a classroom/dryland session with us. 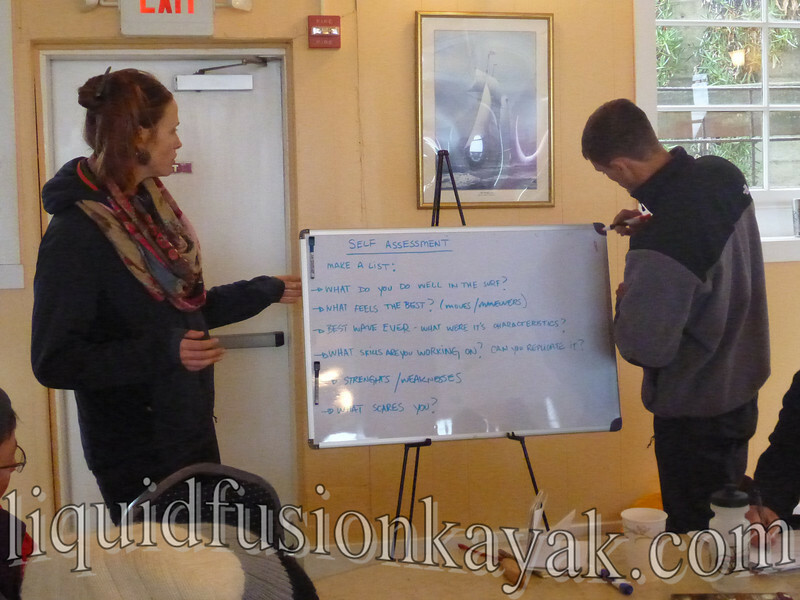 We were excited to have 6 students join us for a day of in depth instruction on surf zone topics including etiquette, waveology, and skills for performance surf kayaking. Lots of "ah-ha" learning moments occurred and everyone left the class excited to try some new techniques in their next surf session. Kate Hives and Matthew Hoff start a self-assessment exercise at GGSKS. Decompressing from an active 10 days of teaching, began on Monday with our annual post GGSKS coaches paddle. Matt Nelson, Paul Kuthe, Bryant Burkhardt, Jeff Laxier and I enjoyed a 2 hour play session on the Mendocino Coast. Our rock garden session included riding some fun pour-overs, shooting through slots, and threading the needle through some dynamic and technical rock garden passages. Matt Nelson styling a pour over. 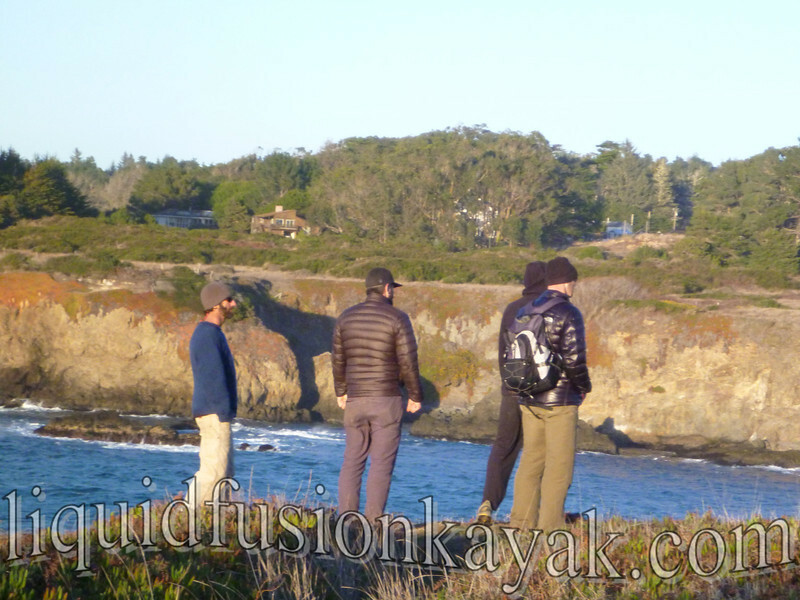 We all appreciated a post paddle hike in the forest and along the coast - stretching out our paddling muscles, enjoying each others company and marveling at the beauty of the trees and waters of the Mendocino Coast. Coaches appreciating the beauty of the Mendocino Coast. The speed of the whirlwind has abated but I still find myself in motion as I catch up on correspondence, upload photos, blog, catch-up on homework in my fern and wildflower class, prepare for Friday's presentation at the local high school's career fair, and do the final organization for Sunday's Valentine Tea (a fundraiser for Books for Babies/Kits for Kindergarten). But you know the saying - a rolling stone gathers no moss . . .